Recently, I’ve been fascinated with the various crossovers within the Maker Movement and different areas of everyday life. Can you be a “Maker” if you are an artist, a chef, or designer? I wanted to learn more, especially in the bartending and culinary world. I decided to ask a mixologist and good friend of mine, Jared Hirsch, to answer some of the questions swirling in my head. Hirsch has made a name for himself in the world of cocktails and mixology. He just started his own business off of an inventive idea for a cocktail syrup called “Caged Heat.” As of late, I’ve been fascinated with mixology and the modern twists to bartending, noticing that many old practices are being revived. This got me thinking about how the Maker Movement may play a bigger role in the world of food and beverages. I mean, why not? People are becoming increasingly more and more creative in all aspects of making. I’m Jared Preston Hirsch and I do many things. I am a Bartender, Cocktologist, Bar Manager, Owner of NickelDime, LLC — Makers of craft cocktail syrups — former theatrical Lighting Designer, theatrical Production Manager, and performer. How do you think the Maker Movement has influenced bartending and making cocktails? To understand craft cocktail culture you have to look back at the history of mixing drinks (see David Wondrich’s seminal book: Imbibe). Cocktails grew out of the later years of the Industrial Revolution in the later half of the 19th century. America was awash in new ways of thinking and full of gumption and the entrepreneurial spirit. New ways of looking at old methods armed with new technologies set us apart from the world, and the same was true for drinking. American mixologists (yes, the term is an old one) took the European style of drinking punch — which was designed for larger groups — and started to make individual drinks with the invention of the ice maker in the 1850s. With the ability to turn out drinks per order instead of making one drink everybody shared, innovation and novelty became the norm. Old technologies like distillation and fermentation improved with innovations in their own fields, and with it the quality of the drink. Mixologists, many of whom were found in port cities like New York, New Orleans, and San Francisco, had access to fresh produce, spices, and sugar and made their own ingredients like gomme syrup, raspberry syrup, and pineapple syrup. This was the Golden Age of drinking and it was due to the American spirit (what we would call DIY now) combined with technology that made it happen. Sounds like the 19th century version of Maker culture to me. Flash forward to Prohibition. All of that innovation was thrown out and the only thing that became important to the drinking public was that they could get any alcohol at all. The quality dropped dramatically and no one cared anymore if the drink was a good one. When Prohibition was repealed, the cocktail culture didn’t return. All of the practitioners of cocktail making fled around the world and hung up their hats and retired. The one thing that remained was the Soda Jerk. Bars turned into soda fountains. Here was cocktail culture living its sober life peaking in the 1950s and early 60s. House made ingredients were de rigeur at the soda fountain. Soon, entrepreneurs industrialized these products. Jerks stopped making their own ingredients and embraced the technological advancements of the space age where you bought your syrups from a traveling salesman. As happens with any capitalistic venture, producers started looking for savings, these ingredients lost quality over time, resulting in the rise of artificial sweeteners, high fructose corn syrup, and synthesized flavors. By the 1980s the alcohol industry had followed suit. Their products became generic, full of artificialities, and through mass production lost their soul. They no longer represented what they once were. Everything became bland and was hidden behind marketing veneers so shiny you could only see yourself reflected back at you through their filters. Why do you think people are inspired by reinventing cocktails and bartending? We lost our way. We no longer knew how to make things for ourselves and with it the value of doing so. We lost the ability to customize it to our own desires, to tinker with it, to improve it. To reimagine it for ourselves and our times. With the rise of DIY culture around the turn of the 21st century, so too did the American Bar become a place of making things for themselves. It grew out of need and desire. There were always people who didn’t forget how to do things the old way, for themselves, but now we couldn’t find the old ingredients. We had to make them for ourselves. As the first bars started to make their own ingredients, they rediscovered all the old drinks and the skills that went into creating them. Suddenly and swiftly Sour Mix was being dumped down the drain in favor of squeezing your own juice. Simple syrup began to be made by the gallon. Vermouth returned to the bar menu. People stopped calling any mixed drink a something-tini. Quality returned. Fake flavored vodka saw its first erosion of market share. A revolution was forming. One where craft was celebrated. The DIY movement had met the cocktail bar and it was glorious. Now, everyone is making their own bitters. A few years later the newly minted mixologists turned from the old and began to invent to the new. Much like how Maker culture grew out of the DIY culture, so too did the craft cocktail bar become the molecular gastronomic bar. At first it started with bartenders borrowing the ingredients found in the kitchen. Herbs first, then everything else they could get their hands on. Visiting the farmer’s market became compulsory for a craft cocktail bar. Seasonality, freshness, and balance grew in style. Then, as the molecular gastronomic movement took hold in the haute cuisine, so too did it make its way in to the bar. Bars like Booker and Dax led by Dave Arnold in New York and the Aviary in Chicago were using sous vide vacuum machines, water circulators, rotovapors, centrifuges, and spherification equipment to reinvent the cocktail. What have you noticed about the recent changes since the Maker Movement has started? At the moment, these technologies are just starting to hit the home chef and with it the home mixologist. As water circulators for sous vide cooking drops in price, it is ending up with the home bartender. Whipped cream canisters are being used to make home rapid infusions using nitrous oxide. 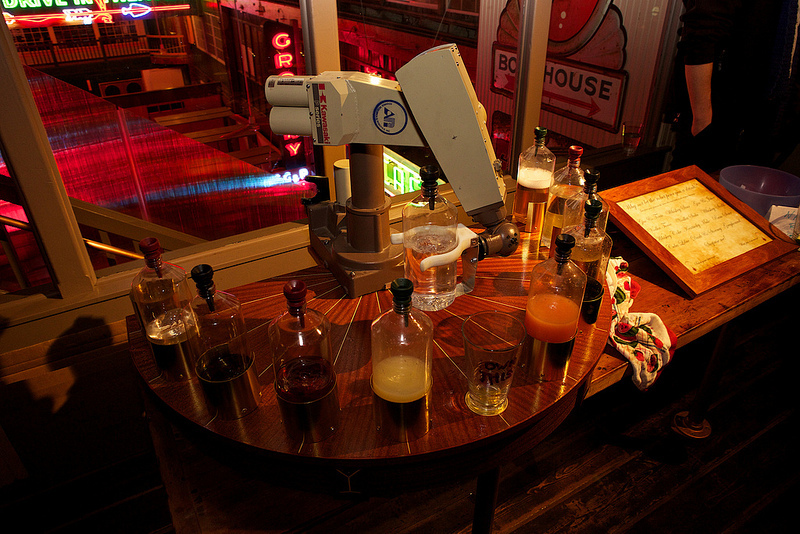 What do you think of robot bartenders? I have concerns about robot bartenders. The danger that the Maker Movement has yet to address is the erosion of interpersonal relationships. Technology has the power to connect us deeply with society, but all too often it is isolating us. As we build more and more devices to assist us with our daily lives it removes the human interaction that used to be necessary to complete the same chores. So too with robot bartenders. Amazing machines, often filled with whimsy and awe. Right now the appeal is of a wow factor. But as it becomes commonplace it will erode that novelty. The ability to perfectly execute a complicated cocktail time and again with speed is something any bar owner covets. With no hourly wage to pay, workman’s comp to pay into, or annoying interpersonal dynamics to sort out, they seem like a panacea. But we risk losing the very thing that holds us together. Us. A well crafted cocktail has soul. It has heart. It comes from passion. Watching a person carefully create a cocktail in front of you is a spectacle of the human kind. Any machine can do it if you program it correctly, but a human is something unique unto itself. Human interaction challenges the brain in ways that no repeatable function can. It teaches us about our own humanity. Who we are in the world. It depends on how you define Maker. I’m a craftsman and artist, but I lack the coding gene. Despite countless hours on Khan Academy, trying to learn to code, I can’t program an Arduino. I do however build things. I come from a family of craftsmen and women. I have always gravitated towards projects that I can build with my hands. Models, kits, puzzles, art projects, crafts of all sorts. Tell me about Caged Heat and the inspiration behind it? Caged Heat is a craft cocktail syrup for the home bartender. A syrup made of Tamarind, Cardamom, and Ghost Pepper, it’s roundly tart, warmly aromatic, and seductively spicy. It’s the first of several products from my company, NickelDime, that hope to bring the ingredients of craft cocktail culture home to your bar. It’s not a cheat. You must squeeze your own lemon juice and use the tools of the trade to make it properly; a jigger, a cocktail shaker, and a juicer. First conceived for St. George Spirit’s Breaking and Entering bourbon release in 2012, it became the best selling cocktail at Oakland’s Sidebar and San Francisco’s Southside Spirit House where demand for it outgrew my ability to make it in the restaurant’s kitchen. We just finished a successful fundraising campaign on Kickstarter, reaching its goal in 7 days and finishing at 135% of its funding goal. We are about to begin a small batch production of it in a commercial kitchen in Oakland and bring it to market.